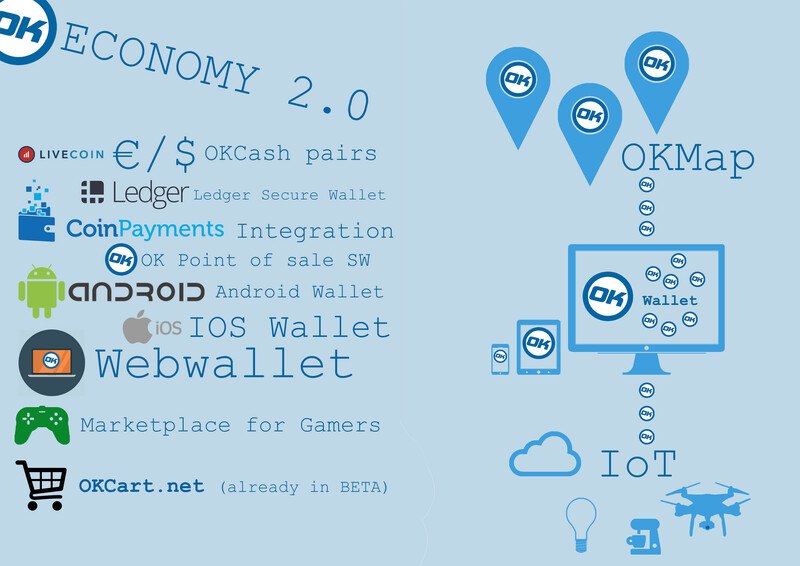 OKCASH ECONOMY 2.0 Plan and Community Projects! ► OKCASH ECONOMY 2.0 Plan and Community Projects! i completed this little infographic here. OKcash is building on strong fundamentals. It has to grow step by step on its way to beeing a widely used cryptocurrency. This shows the huge community spirit of the okcash family! There are many other projects in store and awesome things to come in the future! Re: OKCASH ECONOMY 2.0 Plan and Community Projects! Absolutely brilliant infographic you made there CGB, Bravo! Thank's for the update @CGB! 2.0 keep movin'! I get some of it, but some of it I am confused on as either like with the ledger do we not already have that with the block chain or are we talking about something more advanced that the blockchain is imported into with additional info like contracts and what not that can then be read off through software once unencrypted by holding the key and wallet.dat file the info was encrypted from? also is any of the features shown here like escrow for people who want to do business directly or on the market place to protect both the buyer and the seller from fraud?